Custom 4x7 inch one team Oakland Team football schedule hair care football shape magnets are not typical promotional choice for hair care salons, but certainly a unique one. 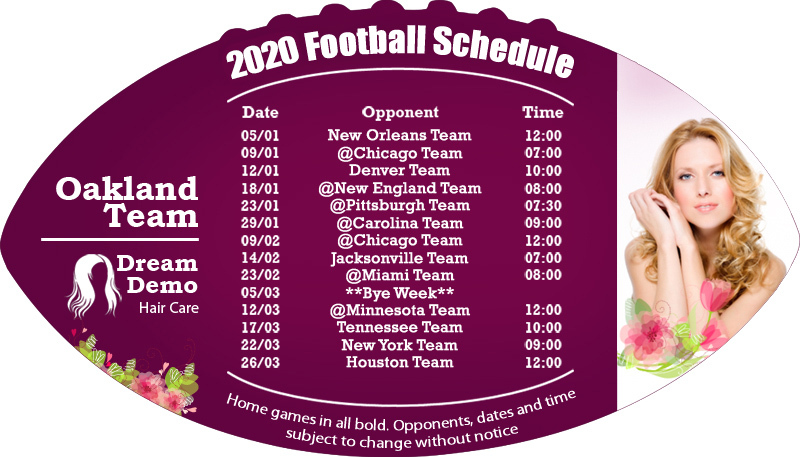 This season, they are trying to reach out to more customers by gifting away customized 4x 7 inch one team Oakland Team football schedule hair care football shaped magnets. Because they are known to boost spirit of an onlooker by their shape and holds their interest with information imprinted against it. Also, they are capable of tying up their interests of an onlooker even after the season ends.